Elements of Taste at McWane Science Center combines the traditional with the unique, creating an experience for your guests, that enhances any style of event. Whether you’re looking for a healthy lunch, elegant hors d’oeuvres, formal banquet or picnic dinner, McWane Science Center’s catering can develop a custom menu just for you. Please contact our Special Events Team at 205.714.8363 or events@mcwane.org for sample menus or a custom proposal for your event. 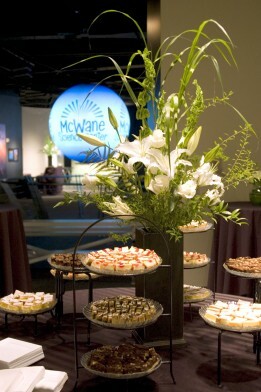 All catering and beverage service must be provided by Elements of Taste at McWane Science Center. No food or beverage may be brought into McWane Science Center by the client or any of the client’s guests utilizing the space. Exceptions made for celebratory cakes when approved by the special events manager prior to event date. McWane Science Center provides rectangular (6 x 2.5) and/or round tables (60 inch and 66 inch). Linens are usually provided by your caterer. If you need to rent linens, you may rent them from McWane Science Center for a fee of $5 per linen. All bar service must be provided and served by McWane Science Center staff.